Just over two months till we leave! Yikes! There is little question that time is winding down rapidly toward our planned June 11 departure! The two Hodakas are currently at different levels of preparation but are, as one might say , "coming along." Jack's 125 Wombat has been ridden a bit in the past couple of weeks, albeit with the "mule" motor, not the specially prepared one intended for the trip. It seems a good chance to establish the functionality of the motor which will be set aside as a spare and also to do systems checkout for the rest of the bike - running gear, electrics, and such. Electrics are getting a lot of attention as they are admittedly an achilles heel (one of several actually...) of virtually every 1970's bike. The liberal application of mil spec wiring and connectors, contemporary harness insulation, and protective covering where wires pass by sharp edged metal components is all being counted on to reduce the risk of electrical "drama" while on the road. 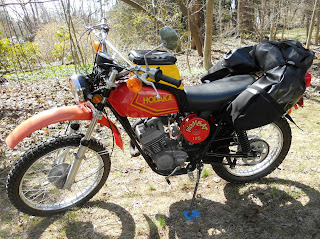 Don's 250 Thunderdog is pretty much completely assembled and just about ready to start. An exciting development just this week is the first trial fitment of our chosen soft luggage. The great folks at Giant Loop Moto in Bend, Oregon (GiantLoopMoto.com) have joined us in our quest and have helped in the procurement of both their "Fandango" Tank Bags as well as their unique "Coyote" Saddlebags. Soft gear is a must for a trip like this in order to keep the weight down ("don't need no stinkin' luggage mounting racks") and to provide maximum mounting flexibility for these nearly 35 year old bikes that were never designed for luggage. "Fandango" and "Coyote" provide those features as well as appearing to offer the promised "bomb proof" durability required by a trip like this. Time will surely tell but, in any case they look good fitted up on the bike. We'll be reporting on how they both work out during our travels. A number of (skeptical) friends have commented about the seeming craziness of this trip but we both view it as just another great adventure. In the next few weeks we'll be talking in more detail about bike preparation, routing, packing, the gear we've selected, and abit more about ourselves - who we are and why we're doing this. Join us along the way!